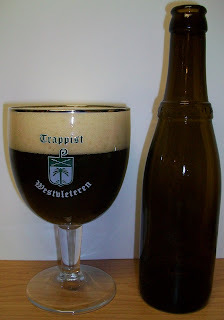 One thing a can add is that my good friend Kirk also lent me his Westvleteren glass to review this bier in. I guess it’s also worth mentioning that this is my 200th beer review. So let’s get this show on the road. The bier pours a very hazy dark brown with amber hues and a fairly rich off white to tan head. The nose is exquisite; rich dark roasted malts, wonderful notes of caramel, dark chocolate, dark fruit esters and yeasty notes. This is extremely inviting. Give me a minute while I try to compose myself. WOW does not come close to describing this exquisite bier. My only problem is that the expectations for this bier are extreme so I’m having a hard time second guessing the experience. The first sip was amazing. Sweet rich roasted malts up front on the tip of the tongue then the most exquisite creamy mouthfeel throughout the middle of the sip. The back end was extremely easy drinking for such a rich bier. There is also a high carbonation release during the swallow that mask a lot of the flavors. The finish is nice, very nice with sweet rich malts and notes of dark fruit, sweet caramel and that classic Belgian yeastiness. Most of these flavors carry out through the final aftertaste. There is also the most exquisite malt coating throughout your mouth. Just Amazing. I keep thinking whether this is as good as the hype or not. But I’m trying to suppress that for now and just enjoy this bier and see where it takes me as it warms and opens up a little. It sat for a few minutes out of the 40 degree beer fridge before I opened it. By the time I got a few pictures and finally sat down to review it the bier was around 50 degrees. I’m in no hurry and have only had two or three sips so far. I’m going to let it sit for a few more minutes and continue review. The head has diminished to a nice protective cover over the top of the bier. There is a nice ring around the edge of the class and it is leaving some lacing. Ahhh man, this is just getting better and better as it warms and opens up. We are now at 58 degrees. What a bier! I’m still trying to leave the hype behind me but this is a great Belgian Quad with or without the hype. St. Bernardus Abt 12 and Malheur 12 Are currently on the top of my list as the best biers for this style. I can honestly say that right now this exquisite ale is inching its way past both of them. The complexity and exquisite mouthfeel of this bier is by far superior to both of them. As for the absolute flavor profile it’s hard to say without doing a real head to head with the other Quads. So let’s get back to reality and continue sipping what’s in front of me. I am really impressed with the rich creamy mouthfeel of this bier. I thought the complexity would increase as the bier warms but surprisingly enough there has not been much change as it is warming. We are now at 65 degrees. And I’m getting to the bottom of this glass. This really has flattened out. Well, that doesn’t sound too good let me explain. Early on I perceived a complexity and I expected each sip to be different as this bier warmed. That did happen up to around 58 degrees. But from 58 to 65 there rally was no change. Again I need to deal with what’s in front of me not what I expected. I’m down to just a few final sips and we are just about at room temperature at 68 degrees. Wow that last sip was still great. So all hype aside this is an outstanding Belgian Quad. Is it the “Best Beer in the World”? I really can’t say but I can say that this is an outstanding Belgian Quadruple and most likely the best in it’s class for sure. The other thing is that this is still pretty young. You have to remember that my friend Kirk just picked this up at the monastery in July and it is only October 2nd. I thought about cellaring this for a few years but I just had to open it and do this as my 200th review. Let me do the lees and then I’ll give my final thoughts. The lees really don’t look that intimidating. They are a very dense brown, completely opaque with no light getting through at all. It is a little bitter but not overwhelming. I’m still glad I did not pour them into the bier. They are also very yeasty. Wow, that final sip was pretty harsh. All and all as far as lees go these were not too bad. Honestly, I have has more complex artisan biers from Belgium that I have liked better than this one so I can not go along with this being the best beer in the world. But is this the best in style for a Belgian Quad? Well, I may have to agree with that. 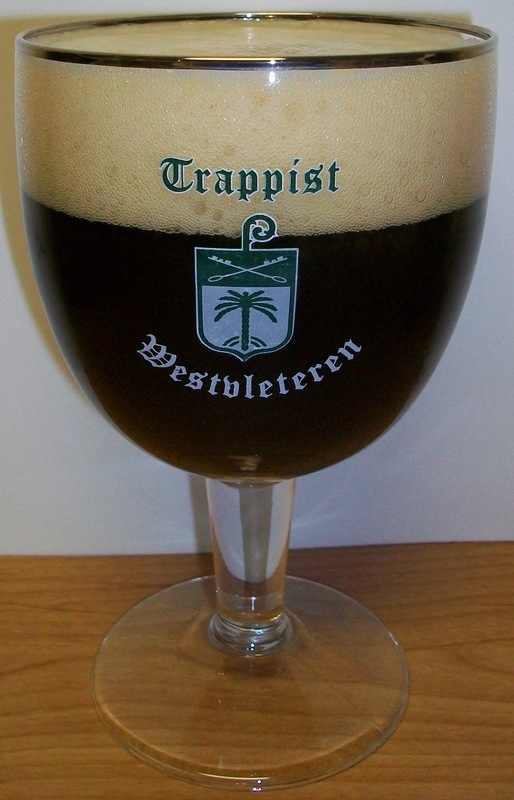 The bottom line is that is an exquisite Belgian Quad and most likely the best in class. I’m sure it will only get better with age. For such a young bier to be this exceptional means a lot. This must be outstanding after cellaring for a few years. For a final rating I’m going to give this an A+. Even with this being a young bier it is still an exquisite Quad and may be my new gold standard for this style. This is an exceptionally malty Quad with and most exquisite creamy mouthfeel. Rich malty goodness to the very end.